Decoin is one of the latest innovations on the cryptocurrency market that has been drawing the attention of many crypto enthusiasts, investors, and financial leaders. The recently-launched platform is making a stand with impressive features, such as sharing its profits with its loyal coin holders and awarding their customers with a 6.2% average annual increase rate. A cryptocurrency platform with such interesting features can’t but make numerous crypto specialists turn their head towards its way. 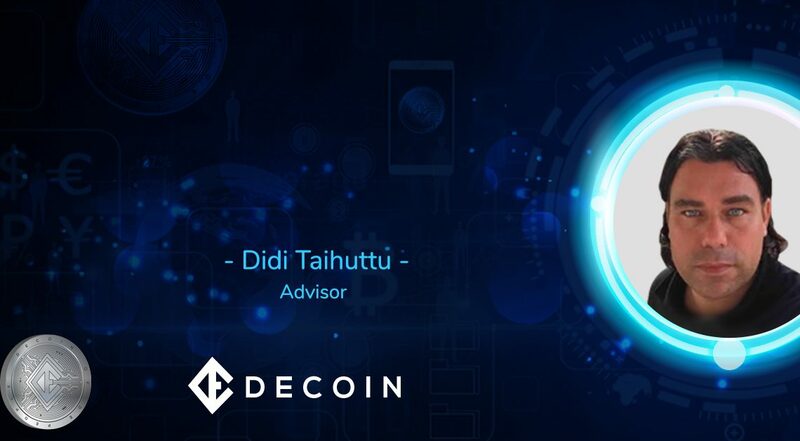 For example, one of the new additions to the team of Decoin is Didi Taihuttu, who is a well-known entrepreneur and a renowned ICO marketing advisor. Moreover, Didi Taihuttu has a long and successful record of consulting and advising various businesses in the finance sector and coming up with strategies and marketing models to connect companies and clients. Decoin would like to remind everyone of their upcoming release and the many benefits Decoin has prepared for their clients. Firstly, the Pre-ICO sale at $0.6 is still available and will run from April 23 to May 20. The official end of the ICO and the public release of the coin at a starting price of $0.9 will be available after June 11. Clients who plan on investing in Decoin are going to get various benefits, including a guaranteed loyalty reward of a 6.2% average annual increase, just as mentioned before. Decoin has developed a solid system that will secure the financial position of the clients, regardless of the market changes. For instance, holders will still be able to get profits from the transaction fees and the daily accumulated volumes of exchange. Moreover, the clients will receive a direct access to their products by using their personal D-TEP credit card. Multilingual call centers and a 24 hour support is expected to be launched soon and will be welcoming and providing information and education to any potential client who is interested in investing.